East London's Theatre of Dreams for the West Ham faithful, although being West Ham, performances can range from inspirational and amazing to complete and utter pants. The Boleyn Ground is an all-seater stadium. Since the re-development of the West Stand or to give it it's official name the Dr. Martens Stand (main stand on Green Street), it looks incredible from the outside, and makes for a very attractive stadium. Capacity has reached the dizzy heights of 35,000. If you have a ticket for the top tier of the West Stand, there is a damn fine view. It has also got rid of the bloody awful pillars that obscured the view for many a year. The only blight that some may say exists is the infamous Chicken Run or East Stand. Mainly full of Home season ticket holders, this is a rather old and poky, though current there are on going discussions with Newham Council to re-develop this part of the ground. What also comes with all-seater stadia is the loss of atmosphere from the crowd, and it is quite noticeable at times that the home support does go a bit quiet from time to time, especially if the home side is not performing to their ability. Away fans enter the Boleyn Ground now via the Priory Road entrance and are situated in the North Bank, lower tier (or to give the stand it's official name, The Centenary Stand). This used to be the preserve of the home fans but now a good chunk of this section is reserved for away support. Allocation is about 6-9% of ground capacity, dependant on what allocation your club takes up. Catering HAS improved somewhat over the years, yet unfortunately for those in the North Bank, it still gives an impression that the kiosks have just been built by an 8-year old with a mountain of Lego. Just doesn't seem an integrated part of the stadium, more of a 'bugger, we forgot to add this on' job. Shame. Half time pint can be all rather frantic, so best to camp there early before the hoards charge their way through. As with all things, there are amusing chants that come from both sets of supporters - London derbies are quite good for this. Midweek games appear to be attended by die-hards and season ticket holders from the away fans. Take North Circular (A406) to A124 (East Ham), then on Barking Road for approximately 1.5 miles until you approach the traffic lights on cross-roads. Turn right into Green Street, ground is on the right hand side. Use A13 (signposted London) then at cross-roads turn right A117. 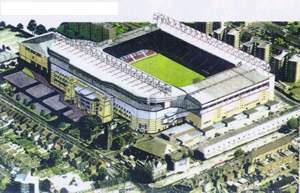 In 0.9 miles at cross-roads turn left into Green Street for West Ham United FC. Use Blackwall Tunnel and A13 to Canning Town, then follow signs East Ham A124 in 1.7 miles turn left into Green Street for West Ham FC. Take North Circular (A406) to A124 (East Ham), then on Barking Road for approximately 1.5 miles until you approach traffic lights on cross-roads. Turn right into Green Street , ground is on your left hand side. Take the underground to Upton Park tube station which is on the District Line. The ground is only around the corner from the station. Turn right along Green Street past the market and the ground is a bit further down on the left hand side. Numbers 58, 104 and 330 run along Green Street. The number 238 from Stratford to Barking goes along Plashet Road. Numbers 5, 58 and 147 go along Barking Road. Street parking only. The best areas are around Romford Road and south of Barking Road. This pub is owned by The East London Pub Company, and is located on Green Street. May not be the ideal pub for away fans, but if you are not wearing colours, and can put up with a fair amount of home support, then this makes for a good pub for a pre-match pint. This pub is owned by Taylor Walker, and is located on Green Street. Very popular pre & post match boozer. Away support has been seen in there with colours on. Quite a good atmosphere, especially on Saturday matches or if is a big game. Located on Green Street. As the signs say quite clearly on the doors and windows, [HIGHLIGHT:No Away Support]. If you ever do walk past it (especially if Man Utd are playing) you'll understand why. This pub serves food, has a pool table, and large screen Sky TV. The perfect footy fans pub! Located on the corner of Green Street and Plashet Grove. Offers Balti dishes, curries, tikka's and roti (not really sure what a roti is to be quite honest....) You can sit down inside to have your grub. 365 Green Street, E13 - Open from 10h30 to 18h00 - situated just outside Upton Park tube. Fairly popular on match days and a way to sample a slice of East End London. Turning off from A124 Barking Road. West Ham's favourite Burger Bar - Priory Road, E13. This is a very West Ham place to get food. Painted in claret and blue, it offers many a burger with special names such as the Terminator, named after west Ham hero Julian Dicks. Try the StevieBaconBurger (named after West Ham United and Newham Recorder photographer Steve Bacon) - 2 Burgers and bacon - yours for three notes Guv'nor. Located on Barking Road. Pasties, sausages, fish and chips. Again this is another popular place, and queues can get very long at times. Located on Green Street. Quite popular on match days as it is quite close to the ground. Hamburgers, Hotdogs and cheeseburgers are reasonably priced. Seating is available inside. If you are a registered user then you can login, and create your own personal review of West Ham United Football Club - The Boleyn Ground. These reviews can be private or public.